Update: Many people have asked me to post the source code for this project. The code posted below is in a ‘prototyping’ phase. So code may not follow best coding standards and will be in severe need of refactoring. It is inefficient to have the viewer poll the remote client. The client knows when it has new information. At times, the viewer was polling and the client would essentially return a message indicating nothing has changed. In the real world, asking the remote machine to host the WCF service creates firewall issues. 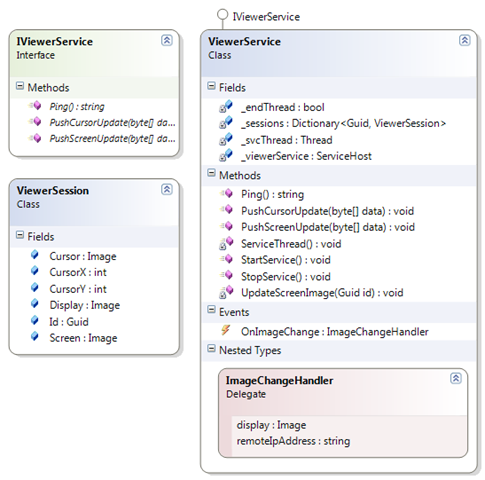 The remote client would need to ensure the viewer could “see” the WCF service. Ping – Used most for troubleshooting. PushCursorUpdate – Used to push new cursor content (the mouse has moved). PushScreenUpdate – Used to push new screen content (the screen has changed). The remote client calls either “push” method via their WCF proxy. The byte array received by the viewer is “unpacked” into image and other metadata. The unpacked data is updated in that client’s ViewerSession. The method UpdateScreenImage is called to merge the screen and cursor content. The OnImageChange event is triggered allowing all listeners to update based upon the new data. // Get a new proxy to the WCF service. // Force a full screen capture. // Run until we are asked to stop. // Capture a bitmap of the changed pixels. // We have data...pack it and send it. // Thread safety on the proxy. // Get an update for the cursor. // We have valid data...pack and push it. // Throttle this thread a bit. In the above video, the WCF service is configured to bind to my external IP address. I was attempting to get some real-world connection conditions into the video. Unfortunately, I think my firewall / NAT resolved the address and the packets never reached the internet. Regardless, the video demonstrates 3-4 screen captures per second from both the clients. The default JPEG compression is doing a great job at minimizing the number of bytes transferred. The image quality is a little degraded when compared to normal remote desktop experience. Overall, I am pleased with the performance. In the next couple of blogs I hope to add some ability to interact with the remote desktop (move mouse, click, type, …). This post will be explain the presentation layer of the photo gallery. how to implement this project. New to WCF. Unable to create proxy. Disregard my earlier question… I see that you have updated the project here. I’m interested in applying some additional “dirty rectangle” logic to the capture logic to see what that does for the overall percentages of changed data. Thanks again for the postings. Jack…I will see what i can do to provide that project. I haven’t worked on it in quite sometime and the code is on an old machine. Did you get a chance to post that Utility project that is reference in project. Appreciate your help. I did update the download. It now contains all the code that is necessary. It previously had all the code, but the solution still referenced an project (‘Utility’) that was not needed. I did a bit of clean up and made the solution start the server and client when you run. Be sure you are running VS using admin privileges unless you will get ‘AddressAccessDeniedExceptions’. There is a download link for the remote desktop code in the comments. This is a bit old (probably VS2008 project). The project was demonstrating desktop sharing, but you could code in the control. Nice work here, i have one question is it possible to control tablet (ipad) from asp web application? Do you have experience with that? This is a great article!!! Fix the bug would be appreciated. Wrong icons being cut off when moving diagonally. hmrok…Thanks for the feedback. I have not worked on this project in quite some time. I have no plans (no time) to revisit and as such, this bug may go un-patched. I appreciate you sharing the discovery with others, so that they can benefit and maybe even provide a solution. Hi CRAVENS ! I don’t know.How to control mouse and process ? I’m using Win32 API to control remote machine. Where is module control ? You use “SVC”.You can introduce “SVC”. I’m trying to build the proxy, but i am unable to do this..
Also i need to say that i am new to endpoints, someone a good howto or can put me in the right direction to get this working?? I have tried the running the solution on multiple machines. As long as I run Visual Studio with Admin privileges (in Vista /Win 7) it works directly as provided from the zip file. Is this not the case for you? What kind of exceptions are you seeing? I have a Windows 2008 server running in DataCenter.. so i want to host Only the proxy part public.. so then the server pushes it to proxy back to the form. Hello Thanks for this project. I JUST HAVE A SIMPLE QUESTION TO ASK YOU SIR CAN WE USE THIS IN A VIRTUAL BOX PC AND A HOST COMPUTER ? AND HOW !!!! BECOZ ITS SHOWING THAT ECHO FUNCTION FAILED ? I liked ur code very much. But i came across an exception. i tried but i was unable to solve it.If u help me or tell me something about this then i will be thankful to u.
I am not certain of what is causing your issue. Sorry that I am not able to help. Came across this excellent post, thanks Bob. Just wanted to know what are your thoughts on whether removing the WCF layers (for an internal LAN solution) and replacing with Sockets would improve performance? Thanks for stopping by. Later I re-did this app using ASP.NET MVC (http://blog.bobcravens.com/2009/10/monitor-multiple-computers-remotely-using-asp-net-mvc/). For a LAN, that is probably a better starting point. I would take a look at the asp.net mvc version (http://blog.bobcravens.com/2009/10/monitor-multiple-computers-remotely-using-asp-net-mvc/) where I implemented a better message passing interface. I was setting it up to pass mouse / keyboard messages back and forth. I have no a proxy, how i can start the server. Are there any way to do it without a proxy server. Can I use my Public IP for that. Please help me! Thank much! I would take a look at the MVC version (http://blog.bobcravens.com/2009/10/monitor-multiple-computers-remotely-using-asp-net-mvc/). The server for that one can be on the internet and then each client only needs to have internet connectivity. I would check out the mvc version (http://blog.bobcravens.com/2009/10/monitor-multiple-computers-remotely-using-asp-net-mvc/). I was setting that one up to be able to pass mouse/keyboard messages back and forth. 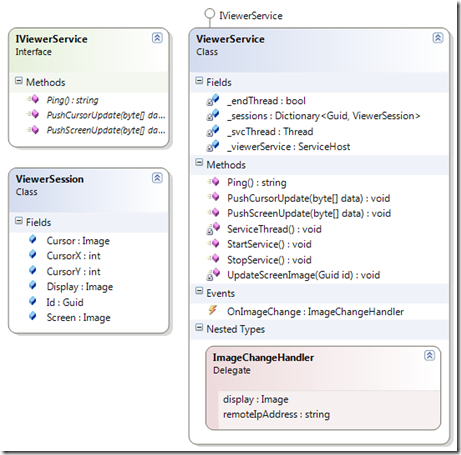 Take a look at the mvc version( http://blog.bobcravens.com/2009/10/monitor-multiple-computers-remotely-using-asp-net-mvc/). It has a better message passing system and could be extended to include mouse/keyboard messages. Why did you use the serverproxy over the client? Also, I would like to consume the code from GitHub, do you know if there is already a clone/fork in there? Thanks for visiting and posting a link to the article on your site. The download for the project is as far as I ever went. I eventually did an asp.net mvc version (http://blog.bobcravens.com/2009/10/monitor-multiple-computers-remotely-using-asp-net-mvc/) that was a bit more evolved. The mvc version had a message bus that I was intending on using to pass mouse/keyboard messages for remote control. I am not aware of any Github repos with this code. Feel free to create one if you want. Maybe post back here with the link so others can fork. HTTP could not register URL http://+:1003/Rlc/Viewer/. Your process does not have access rights to this namespace (see http://go.microsoft.com/fwlink/?LinkId=70353 for details). You need to tell Windows that your application has rights to that port on http. I suggest looking up the netsh command for windows 7 and httpcfg command for windows xp. ex. netsh http add urlacl url=http://+:1033/Rlc/Viewer. Run “netsh http show urlacl” to see some examples. Hi Bob, i am able to view desktop on localhost but not in network or remote machine. Please give solution. Firstly, excellent work! I’m really interested in expanding on the idea that you have here.. My suggestion is to expand the WCF service so that there is a main (rendevouz) server that all clients connect to and the service is hosted on that single server. All clients would connect to the WCF service via TCP and push its updates to the server. Each client would receive the screen updates from the other clients via a callback method? Do you think this would be a viable method as it would remove a large part of the firewall issues from the client side (since they make a single outgoing connection to the server) and the client would only receive updates as and when since it would receive the callback from the server with the data pushed from the other client..
will you please tell me what logic you use to send the screen shot of one machine to send over to another machine over the network. every time are you sending a complete image of desktop to another machine over network or just only difference between prev and current image. if you send only difference then tell me what logic you use to apply the diif on current image at the other end where screen changes are displaying. please discuss my two points in details. Have you thought about using compression on the bytes you transfer during the “PackScreenCaptureData” function? I’m wondering whether some sort of ZIP compression on that data just before its sent, and then unzipped on the other side would help reduce byte size and therefore allow a higher refresh rate? I’m currently converting your project to VB.net and DotNet 4 and the idea occurred to me? Give it a try. If I recall, I was doing JPEG compression, but there may be additional compression left depending upon the algorithm used. I am developing an application that requires remotely accessing Desktop through wp7. Many applications are available for this purpose. But i want to develop it on my own. It is amazing article and is working fine. After start the ServerSide/RemoteDesktopHost and that’s it the capturing will start to work. remote desktop sharing project is very important for me. can you help me ?? can i have email address please ?? I’m getting images from the same computer but on different computers can not be.. Please Help me!… This by the way nice project. Any idea how this could be modified to run as a windows service? I would like to remote the username/password login screen and log in to the remote server. I know the project was published years ago, but I was playing around with it and I’m curious. Is there a way to make the tabs read the local IP or computer name instead of a Guid? I have tried a few ways and have been unsuccessful. I would love any input you have. got the SW working! so forget my previous reply. Just had to change the path of “Microsoft.WebApplication.targets” and the cpu to 32-Bit and off it goes. Will next try the connection to another computer! So no action necessary from your side . Clean code! Wow! Is there a way to patch the sw to a 64-bit cpu? Just for the question.